Three fifteenth-century Majapahit statues go missing in Sragen, East Java. The story underlines the lack of resources and the prevalence of theft of such artefacts in Indonesia. The Thai police have caught a gang of thieves responsible for the thefts of a number of Buddha statues in Prachin Buri Province, including the loss of one 500-year-old statue. Following the earlier story of the theft of artefacts from the tomb of King Khai Dinh, it seems that thefts like these have been relatively common and researchers are worried that there may not be many royal antiques remaining. Thieves have broken into and stolen antiques from the tomb of King Khai Dinh who ruled in the earlier part of the 20th century. The tomb, which is open to public, is located in Hue. Police in Central Java have caught three men in connection to the theft of statues from the Plaosan Buddhist temples, and discover more statues at one of the arrested men’s home. 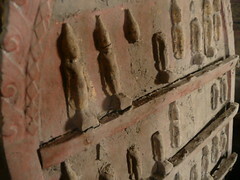 300-year-old Buddha images in a temple in Ayutthaya province in Thailand have either been damaged or stolen by thieves. 100 Buddha statues have been reported stolen from temples in the World Heritage Site of Luang Prabang, fuelled by the trade in antiquities.